The Flex Robotic System, which looks sort of like Wall-E’s phallic little cousin, is developed by Howie Choset, a professor of Carnegie Mellon University’s Robotics Institute, and his colleague Alon Wolf. 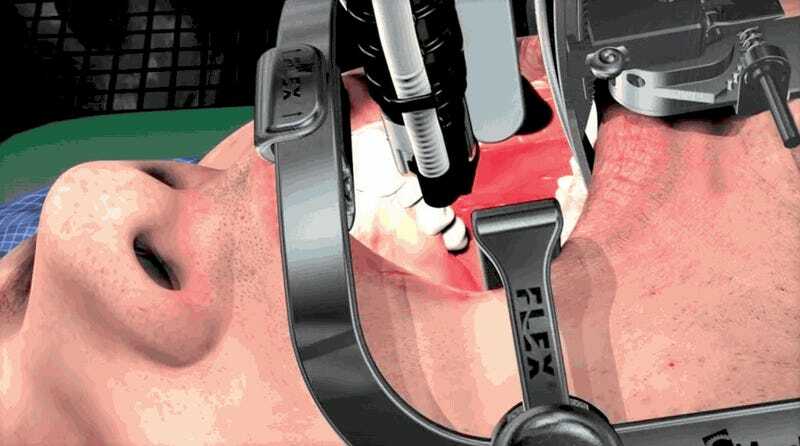 Designed for minimally invasive surgeries in the throat area, the system allows surgeons to navigate to the surgical site via robot and then perform surgery in a more traditional laparoscopic way. Laparoscopic surgery, according to my obsessive viewing of Grey’s Anatomy, is a method whereby medical procedures are performed using tiny surgical instruments attached to very long, very skinny sticks or wires. It’s why an appendectomy today leaves you with a tiny scar instead of looking like you were gutted by Leatherface. But the surgery has limitations. It can’t noodle it’s way around your body like a big ol’ robot snake. After being put to sleep (because no way in hell is anyone swallowing that monster while conscious) Choset and Wolf’s system should allow people to undergo what would otherwise be very invasive surgeries with little more than a sore jaw. Correction (9/6/16): This article originally stated that Howie Choset was the only inventor. It has been updated to reflect Alon Wolf’s contribution.